Cash is the lifeblood of every business. Run out of cash, and you’re dead in the water—you can’t pay your bills or make payroll. Even if you’re not up and running yet and just planning on launching a new business, you’ll need to know how much cash you need to get started and stay in business during those first crucial months. To prevent the horrible situation of running out of cash from ever happening to you, it’s critical to understand how cash is moving into and out of your business. This is why your cash flow statement is so important. Need to set up your first cash flow statement? Download our free Cash Flow Template now. A cash flow statement shows how cash is moving in and out of your business over a certain period of time, like a month or a quarter. This statement is one of three key financial statements for every business—the other two, an income statement (also known as a profit and loss statement) and a balance sheet, complement the cash flow statement and help you see a full picture of your business’s finances. You calculate your cash flow with a simple formula: subtract what you paid out (like bills) from the cash you brought in (your sales). A cash flow forecast is only different from a statement in that the forecast is predicting the future of your cash flow. The forecast can help you predict when you might run low on cash in the future, or when you might be flush with cash and ready to expand or purchase that new truck or another piece of equipment. Cash flow statements and forecasts do tend to be a little more complicated than the formula above, so let’s dive in a bit deeper to explain each line and how they work. But, before we do that, let’s take a quick moment to remember that cash and profits are two different things. Let’s say you sold $10,000 worth of consulting services last month, but your customer hasn’t paid you yet. You would record this sale to show that you had $10,000 in sales and then subtract your expenses (rent, office supplies, and so on) to calculate your profit. Let’s just say you had $5,000 worth of expenses. That means that you made a $5,000 profit last month. But remember: Your customer hasn’t paid you yet. You probably sent them an invoice that said “net 30” or something like that on it. The money your client owes you but hasn’t paid yet is called accounts receivable. So, that $10,000 isn’t in your bank account yet. You did make a profit on paper, but you haven’t collected the cash yet. Cash and profits are different. Want more detail on that? Check out our more detailed article on cash versus profits. Now that we have the cash versus profits issue out of the way, let’s dive into explaining your cash flow statement. Cash flow calculations can be tricky, so I typically recommend that you use a tool to help you do this to avoid mistakes and errors. LivePlan can handle all of the cash flow calculations for you if you want to avoid complicated Excel spreadsheets and formulas. The net profit on your cash flow statement is your profits from your profit and loss statement (P&L). If the number is negative, this means that you took a loss—your expenses were greater than the sales that you made during that month. Calculating your cash flow starts with your net profit and then makes adjustments to it (additions and subtractions) to figure out exactly how much cash is left in the business at the end of the month. When you purchase an asset (like a vehicle or other large piece of equipment), the cost of that asset is spread out over time on your Profit and Loss Statement, even if you paid cash up-front for the asset. This is called depreciation. How an asset is depreciated is regulated by the government. Some asset purchases can be expensed on the profit and loss statement immediately, while others need to be expensed slowly over the course of many months or years. On the cash flow statement, we need to deal with the depreciation expense by adding it back in, since it was subtracted as an expense on your profit and loss statement. If you bill your customers and they pay you 30 or 60 days after you have billed them, you have what’s called accounts receivable—the amount of money that’s owed to you. The accounts receivable line in your cash flow statement doesn’t show how much money is owed to you in total, but instead shows the change to accounts receivable—how much cash you received from customers who owe you money or how much additional money is owed to you compared to last month. If the number is positive, that means that customers that owe you from previous months paid you, and you deposited their money in your bank account. If the number is negative, it means that customers owe you more money than they did last month. If your company sells a product, you probably have inventory. You’re probably going to be buying inventory before it gets sold. When you purchase inventory, you don’t count it as an expense on your profit and loss statement. Instead, the cost of that inventory purchase shows up here on your cash flow statement. You’ll expense the inventory as you sell it, and that’s when it will show up on your profit and loss. So, if you have a negative number here, that means that you’ve purchased more inventory than you’ve sold. Your products are still on your shelves. If you have a positive number, that means that you have purchased less inventory than you have sold. This might not seem possible at first, but think of the example of a bike shop. A bike shop might only buy new bikes two or three times a year. In those months when the shop purchases a lot of bikes, there will be a big negative number in the inventory line of the cash flow statement. In the following months as the shop slowly sells that inventory, the inventory number will become positive. Accounts payable is when you owe money to your vendors and suppliers. Just like how your customers might not pay you right away, you might not pay your vendors right away when you get the bill. Accounts payable keeps track of how much you owe. The cash flow statement shows how much your accounts receivable balance has changed. If the number here is positive, you have received new bills during the month that you need to pay but you haven’t paid yet. If the number is negative, you have paid down more bills than you received during the month. If you collect sales tax (or VAT, HST, GST, and so on) when you make a sale, and then have to give that money to the government, then you’ll show how much money was paid out to the government here in the sales tax payable row. If you pay income taxes, you’ll record those payments on an income taxes row..
For sales taxes, a positive number means that you have collected tax from your customers during the past month but not paid it to the government yet. A negative number means that you have paid more money to the government during the month than you have collected from your customers. This happens because there is often a lag of at least a month between when you collect sales taxes from customers and pay sales taxes to the government. The income tax row offsets the income taxes that you expensed on your profit and loss statement but haven’t paid to the government yet. When you do make an income tax payment to the government, you’ll record that in this row of the cash flow statement. When you buy an asset, like a vehicle or a piece of equipment, you’ll subtract the cash you used to make that purchase. If you borrow money to buy an asset, you’ll deal with how you receive the money from the loan and subsequent loan payments in the “changes to debt” lines of the cash flow statement. If you sell an asset, the proceeds from that sale will show up here. If you get investors to invest in your company, you’ll show that incoming cash here, on this line. For example, if an investor gives you $100,000 in June, you’ll show that entire influx of cash in your June cash flow statement. If your company pays out dividends to its owners or makes any other kind of cash distribution that isn’t salary, you’ll show that number here. These two lines, short term debt and long term debt, operate the exact same way, but are split up to differentiate the different types of loans or debt that your company is taking on. Short-term debt is usually paid back within a year, while long-term debt can take much longer to pay off. If the numbers here are positive, that means that you’ve brought more cash into your business from loans that month than you’ve paid off. If the number is negative, that means that you are paying off more than you have borrowed during that month. So if you get a loan from the bank in June for $25,000, payable over two years, and don’t start paying anything back until August, $25,000 will appear in the long term debt row for June. Nothing will appear there in July, and then in August, you start paying back in equal installments that appear as negative numbers. This is how much cash you have at the start of the reporting period. Here, you’re only talking about cash on hand in the bank. If the reporting period for your cash flow statement is one month, this is how much cash you had in the bank at the beginning of the month. You’ll apply all of the various changes to your cash that happened during that period to this number—that’s what all the other rows in the cash flow statement do. Once you’ve totaled up all of the changes in cash that have happened during your reporting period, you’ll show that number here. This is basically the sum total of all the lines that we’ve defined here in this article (except for “cash at beginning of period”). Finally, take your cash from the beginning of the period, add (or subtract) the change in cash during the period, and you’ll end up with how much cash you have at the end of the period. I hope this helps you make sense of your cash flow statement. It may seem complex, but just remind yourself that it’s simply the cash that’s moving into and out of your business. And, it’s a critical tool to understand how your business is doing. 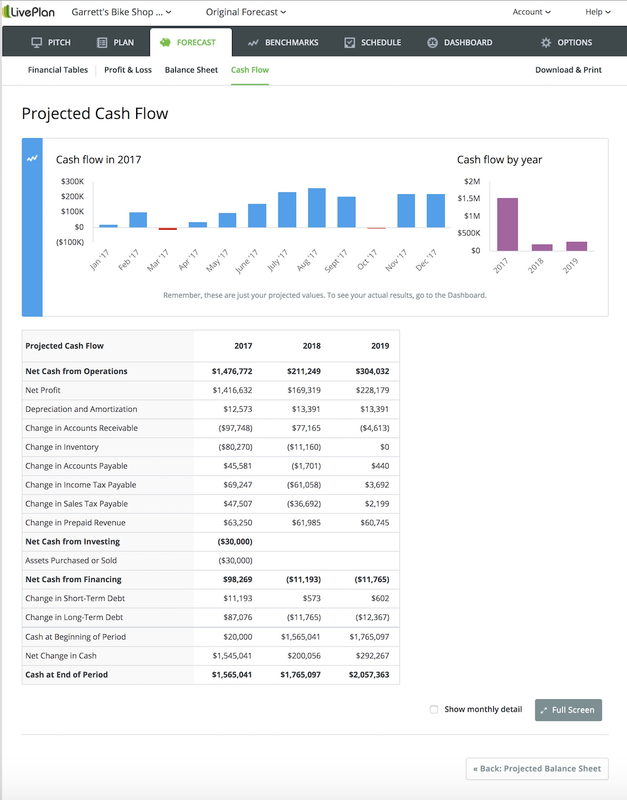 More importantly, you should forecast cash flow on a regular basis and compare your forecast what actually happened (your “actuals”) on your cash flow statement to ensure that you’re going to have enough cash on hand to keep your business running. After all, it’s much easier to open a line of credit or get a business loan when your business is healthy than when it is in the middle of a cash crunch. If you have questions, find me on Twitter @noahparsons. Editor’s note: This article originally published in 2016. It was revised in 2019.